This is a project of one family living in two houses built slightly apart from one another. One great volume of a house which covers the entire plot was supposed first. Then this volume was carved in a curve in three segments and two volumes at the both ends were built as two houses on the site. The wood structures and finishing materials of two houses are standardized to emphasis the relations of two volumes being originally from “one great volume” and that they are one though apart. Carved volume in the middle became a courtyard leading to the approach to two houses. Having another house for movies at night, overnight guests or work at home allows the inhabitants the liberty to do what they please at a time they want. This distance between two houses may be just right for inviting grandparents to move in someday or providing privacy to children at puberty. The purpose of building two houses slightly apart is not the same as that of having a villa at a resort or a farm household having a main building and a barn. This project is an experiment for allowing more life style options in the life based in the urban area. ・ Parents of the wife often visit the house、so take that into consideration. ・ There are many guests, and they need big enough space and kitchen to accommodate the guests. ・ The house is near a university. The house may be partly rented by students of the university. The initial idea was to have two houses on the site. Then in order to signify that these houses are in close relations with one another which are inhabited by one family, this scheme of two volumes evolving from one single volume was created. 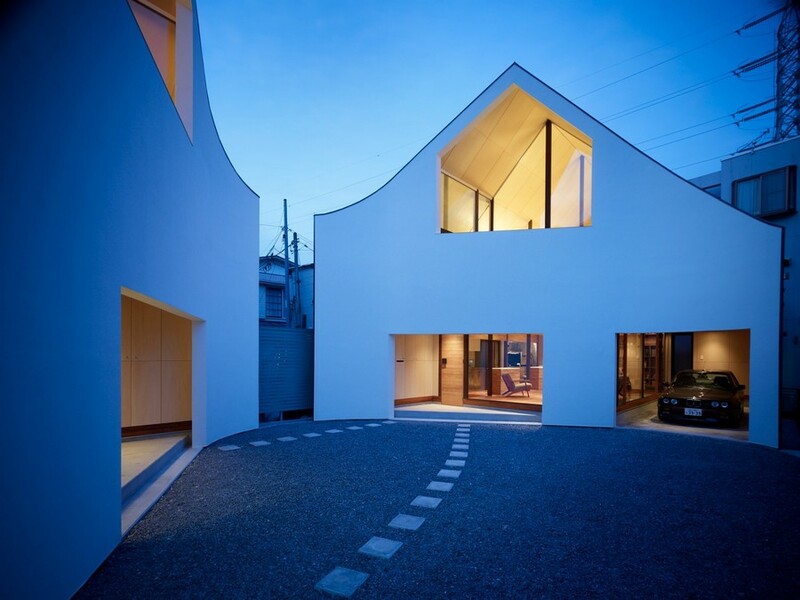 A volume of gable roof house carved in a curve gives particular shape of section. Giving particular and similar section (elevation) to two houses will signify correlativity between the two. The courtyard was expected to give moderate distance and tension between the two houses. The distance between the entrance doors of two houses was fixed for 10m, which was decided by various criteria. ・ You can see the person but not hear the voice. When trees are planted, it really does not bother you if a stranger is living next door. Interior finish is to expose the wood structure. Two houses have common axis which are based on the concept of “two volumes carved from one volume”. Two houses have the common structure which represents the relation between the two houses.